Experience the original Gears of War rebuilt from the ground up in 1080p, including 60FPS competitive multiplayer with 19 maps and six game modes, and five campaign chapters never released on console. Gears of War: Ultimate Edition is also your ticket to the Gears of War 4 Beta. 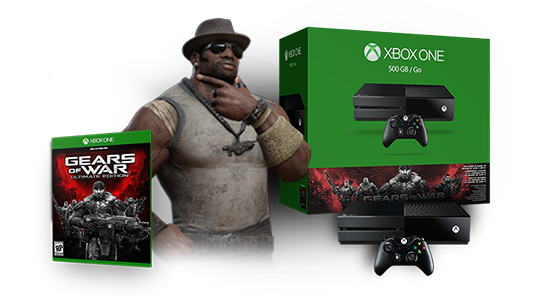 This is the first Gears at its best – a bundle for veterans of the series and newcomers alike. *Available at participating retailers, while supplies last. Gears of War: Ultimate Edition game download code inside. Download from Xbox Live: ISP fees apply. Online multiplayer features require Xbox Live Gold membership (sold separately). For early access to the Gears of War 4 Beta when it launches (expected spring 2016), login to Xbox Live and play Gears of War: Ultimate Edition by March 1, 2016. Must be 17+. Xbox One, broadband internet (ISP fees apply) and Xbox Live Gold membership (sold separately) required. Beta dates, content, and features subject to change. Not available in all markets.